I have broken my own golden rule of empties, never let them roll over to the next month…I have. I have accidentally let 2 months worth build up and now I have major regrets because there’s so many to talk about. I’m going to try the same format as the last one by talking about any new products ie. 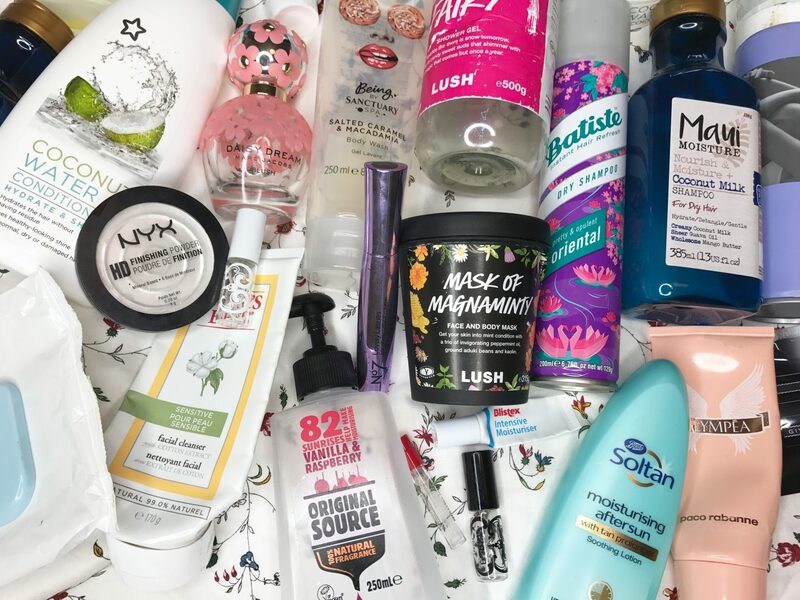 ones where this is the first empty and then list any repeat empties as I’m sure you’ll all be sick of reading about the same face wipes and shampoo constantly. So I’ll crack on because there’s a lot to get through. 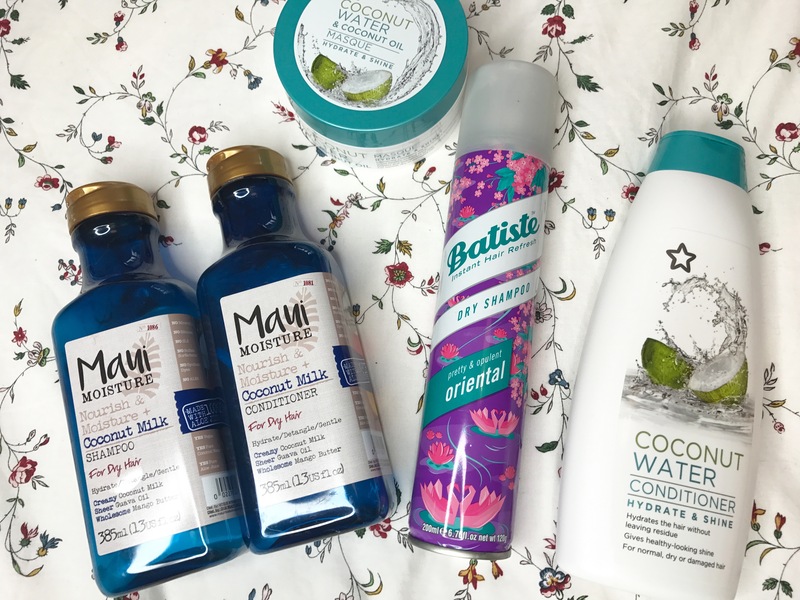 I recently tried out this range from Superdrug, I used this conditioner alongside the shampoo which I haven’t quite finished along with the masque which I will talk more about in a minute. This conditioner smelled amazing and the whole routine left my hair feeling very soft, it’s cruelty-free and it wasn’t very expensive. Would I repurchase? Yes as a slightly cheaper alternative to the Maui Moisture range. I used this masque once or twice a week alongside the above conditioner, my friend Sally picked it up for me as part of my birthday present as she knew I really wanted to try it out. This makes me feel like I have just had a haircut (which I really need to do) and leaves my hair silky soft and the coconut scent lingers all day, which I have been complimented on a few times. Would I repurchase? Definitely as I can tell a noticeable difference when I use it and it’s very affordable when it’s on offer, plus it’s cruelty-free! I always have a can of Batiste Dry Shampoo on hand for days when my hair could do with a wash or just when it’s looking a bit limp and needs a bit of volume. I usually swap and change to try all the scents but I do really like this Oriental one as it’s not too much, plus it’s vegan! Would I repurchase? Yes it smells good, it’s cheap and it’s the best dry shampoo I’ve tried. This is my third batch of these, if you want a full review of how much I love it see my Haircare Routine. Same as above they come as a pair, check out the Haircare Routine again! Would I repurchase? Yes already have. Again this is a repeat, I love these wipes just for wiping my hands while I apply my makeup- I DO NOT use them to remove my makeup as no wipe can do as good a job as a cleanser. Would I repurchase? Yes all the time. 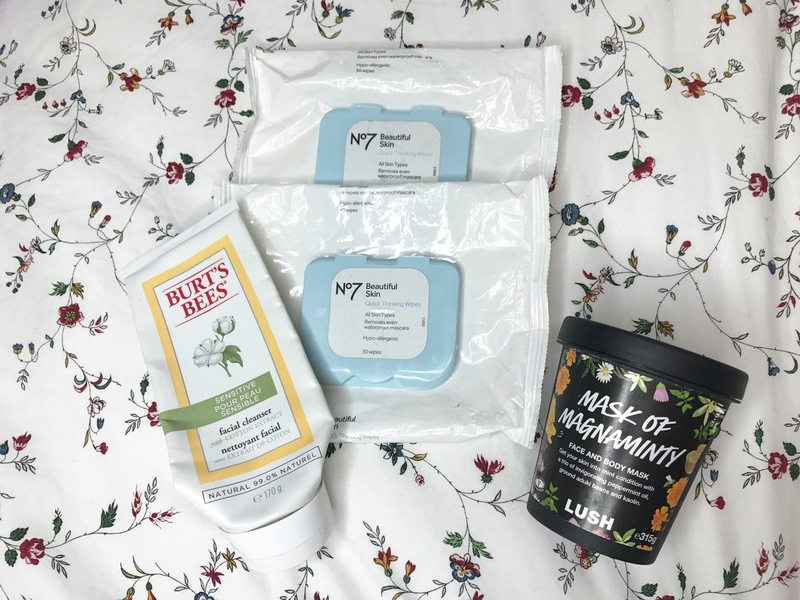 A while ago I needed new cleanser and Burt’s Bees’ was on offer with a free gift including a gorgeous bag and some lip products when you spent £15, you can see a more in depth run down here. I picked up a couple of bits including this cleanser. It is very creamy and would be great for a sensitive skin, however it works better as a second cleanser rather than a makeup remover as it is so creamy. Would I repurchase? This was okay and would be amazing for people with sensitive skin but it’s not the best cleanser I’ve ever used so probably not. I have raved about this mask again and again, see a full run down here! Would I repurchase? Yes Yes Yes! This is like Christmas in a bottle. Love it so much I didn’t want to use it and be without until this christmas so I’ve saved it since last year and started using it this summer, it’s okay to be a little snow fairy in August right? 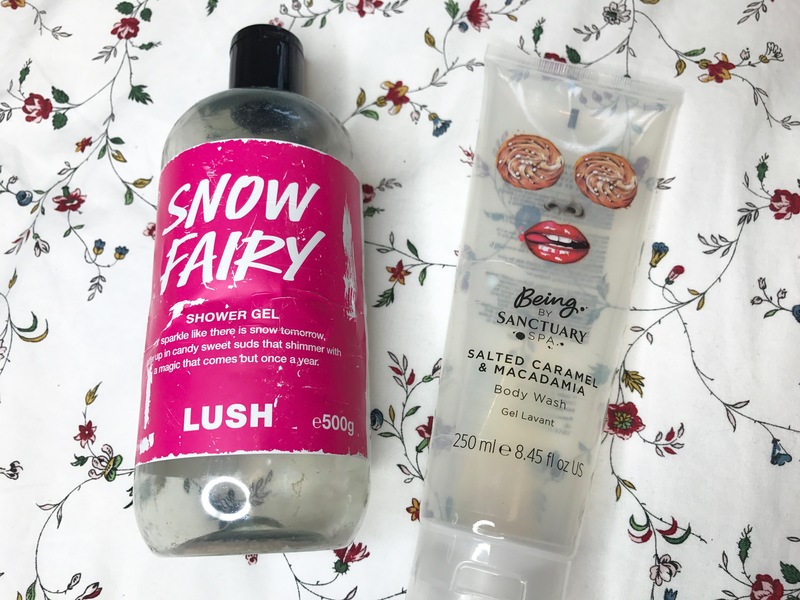 Snow Fairy has a sickly sweet bubblegum scent and I had no problem finishing off the whole 500ml. I always ask for Lush Body Washes at Christmas as they are a little pricey but they are so moisturising and the smells linger with you all day after using them. Would I repurchase? I like to try as many different shower gels as possible from Lush but if I received it as a gift I would 100% use it. One of my favourite new launches of 2017 has been the Being by Sanctuary Spa range, there are a few different scents within the range and they are all gorgeous. My favourite has to be the sweet caramel smell which I have enjoyed din a Shower Gel and Bubble Bath. This shower gel has lasted ages, has kept my skin so soft as the weather has started to turn and has also kept me smelling like a cake shop to boot! Would I repurchase? Yes! I want to try more from the range, so I’m thinking of picking up a few bits using my Boots points. I’ve used this before so you can see a review here. Plain and simple, a day to day essential that is sensitive, doesn’t dry out my skin and is cruelty-free. Would I repurchase? I always pick up a couple of cans to have on standby when this goes on offer. 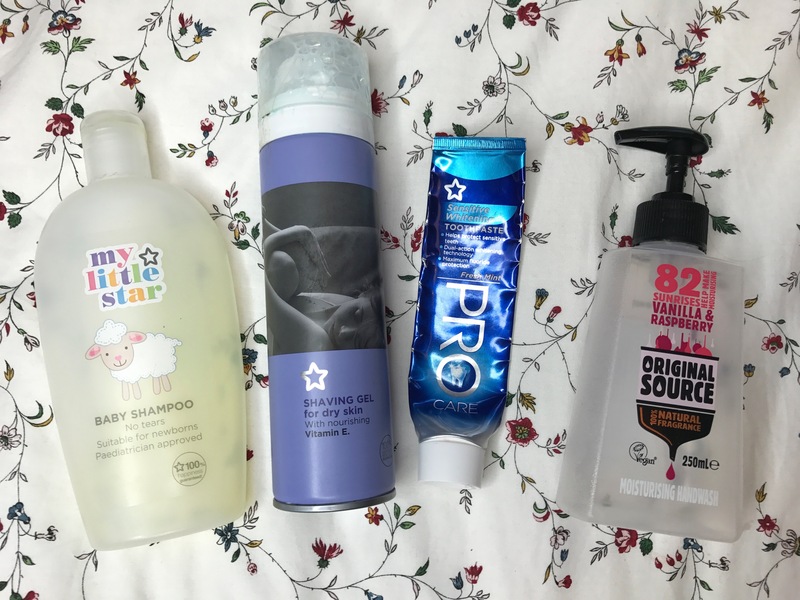 My favourite cruelty-free toothpaste as it is so affordable, it keeps my teeth white and caters to my sensitive teeth without me having to pay a small fortune for specialist brands. This is my favourite hand wash as it smells so sweet and keeps my hands moisturised as they get quite dry especially if I’m working a lot, unpacking the deliveries. It shares it’s smell with my favourite Original Source shower gel and it’s vegan, amazing! Would I repurchase? I always buy this if I find it on offer. I finished this a while ago in a desperate hope to keep hold of what little tan I got i Budapest. It helps to prolong the tan, but it doesn’t as some people seem to think, contain gradual tan. 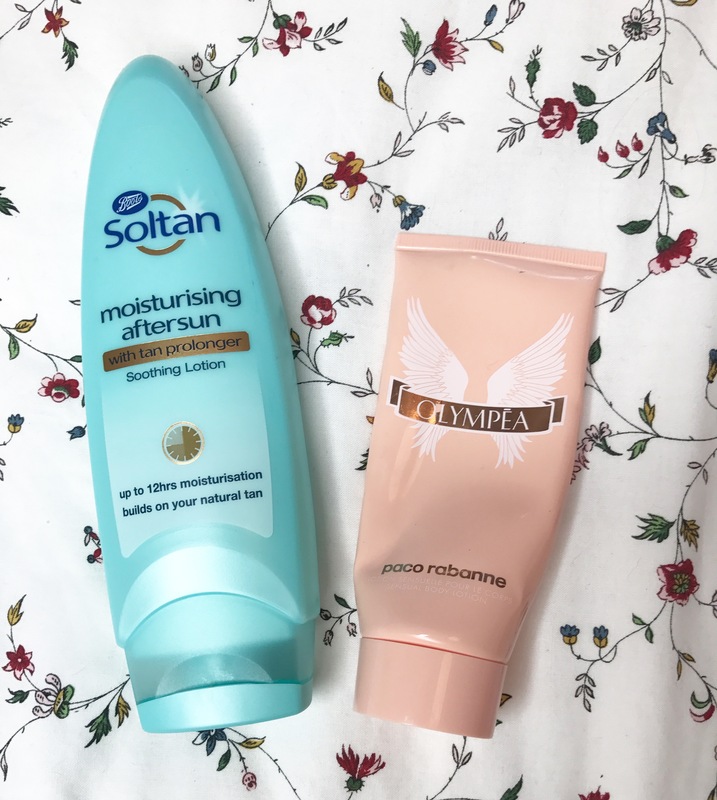 This is very moisturising and Soltan is very affordable so I’m happy to use this instead of spending a fortune on something that does the same job. Would I repurchase? Yes but I doubt I’ll be needing any for quite a few months. I received this in a gift set along with the Olympia fragrance which I received last Christmas, however I believe you can buy a larger size bottle of the lotion on it’s own. It smells super sweet exactly like the perfume and the scent lingers on the skin all day, long after the moisturiser has sunk in. I saved this for ages as I din’t want to waste it so I wore it on a few evenings out for meals and nights out. Would I repurchase? I wouldn’t buy it alone but if it came in a gift set again I would 100% use it up. However I don’t think it’s cruelty-free so I wouldn’t go out of my way to buy it. I’ve had this one a while, I think I bought it in the airport a couple of years ago. 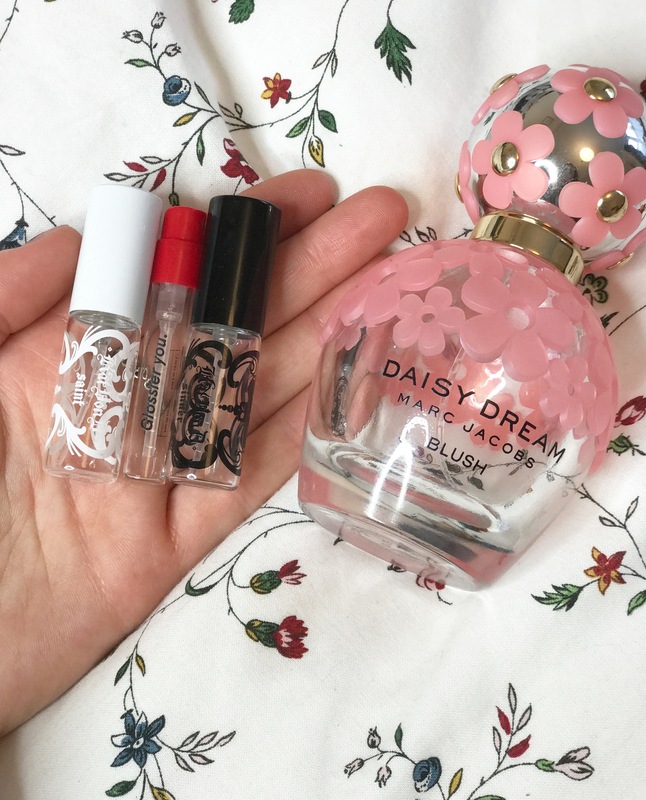 I love Daisy and I have basically had every variation of the original fragrance since, I don’t think this is available anymore as it was a summer edition of Daisy Dream but I have never tried a version I don’t like. This is light everyday scent, however I would avoid if you aren’t keen on floral perfumes. It lasts quite well on my skin despite it’s light notes. Would I repurchase? Not at the moment as I have a bottle of Daisy to use that Josh bought me last Christmas so I don’t need anymore. I received this sample with my recent Glossier order (see what I got here). This fragrance is available to pre-order and is in the final stages of production so keep your eyes peeled over the next fe months. This smells lovely, I can’t describe the notes but it lasted all day, it smelled simultaneously sweet and fresh and lasted all day on my skin. Would I repurchase? I would be interested in the fragrance once it becomes available. When I got invited to the Blogger event at the Meadowhall Student Night, the lovely people at Debenhams gave me a lovely goody bag full of some lovely deluxe samples. This included 2 Kat von D fragrances both Saint and Sinner, both were nice but of the 2 I preferred Saint, so much so that I’m thinking of asking for it for Christmas. Not only are these scents gorgeous they are also vegan and cruelty-free winner!! Saint is more of a day time sweet scent with Sinner being more heavy and evening appropriate in my opinion. Would I repurchase? I’d be tempted to buy Saint in the full size. 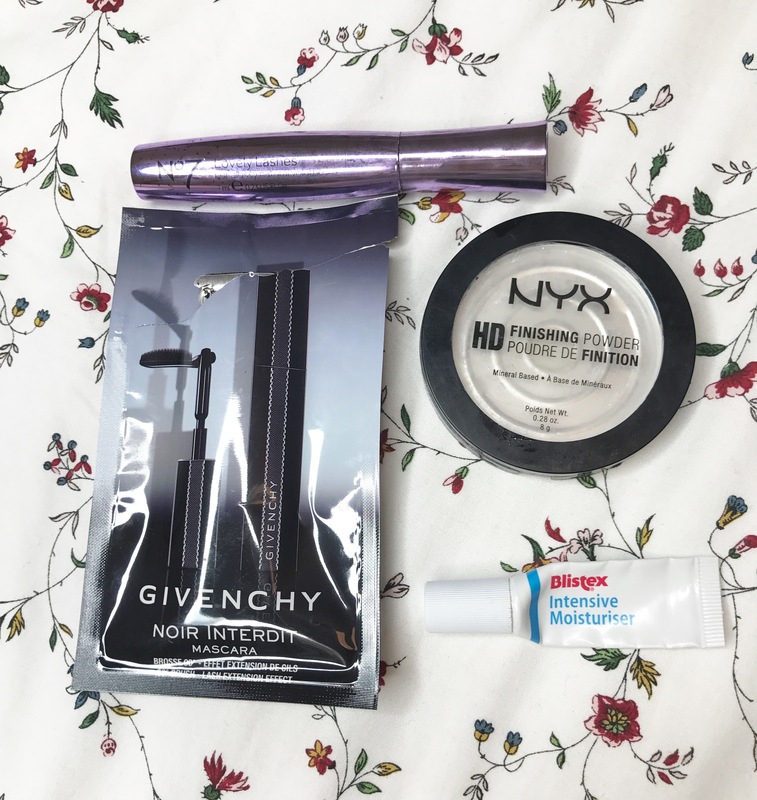 I’ve tried lots of No7 mascaras over the years and I really like them, they aren’t ridiculously expensive and they’re hypoallergenic too so are nice and sensitive. I like this one as the brush is a bristle brush (which I prefer over plastic ones) and it is a good daytime mascara as it isn’t clumpy. Would I repurchase? I like to try different mascaras but yes at some point I probably will. This is my favourite and the only powder I use, it is so finely milled, it doesn’t make my makeup look cakey but it stops any excess of oil so keeps everything in place and stops any smudging, especially under my eyes. Would I repurchase? I already have! I’ve had loads of these over the years and it is soon good if your lips get really chapped which mine do from the air-conditioning at work. This lip balm is super minty and creamy so it’s great to apply overnight to let it really sink in. Would I repurchase? Possibly if my lips get very dry this winter but I have recently discovered Glossier balm dotcom which is similar and cruelty-free. So I received this sample in the same goody bag as the Kat von D fragrances, so this mascara made my lashes look super long curled, it stayed on all day and it took some effort to remove it so I think it would be a good one for a night out. However I did not like the application of this, I thought it was due to it being a sample but having looked at the actual products I’ve realised it’s the same. The brush flicks up so the angle of the wand can be adjusted, unfortunately that makes it feel like it’s moving whilst you’re applying the mascara so I was constantly worried I was going to end up with it all over my eyelids. Would I repurchase? No I’ve tried other mascaras with better wands and I believe it isn’t cruelty-free. So there you have it, all the stuff I’ve used up over the last couple of months, hopefully next time there won’t be this much but suppose there were quite a few samples and I have finished up fragrance and makeup which have been on the go for a long time! 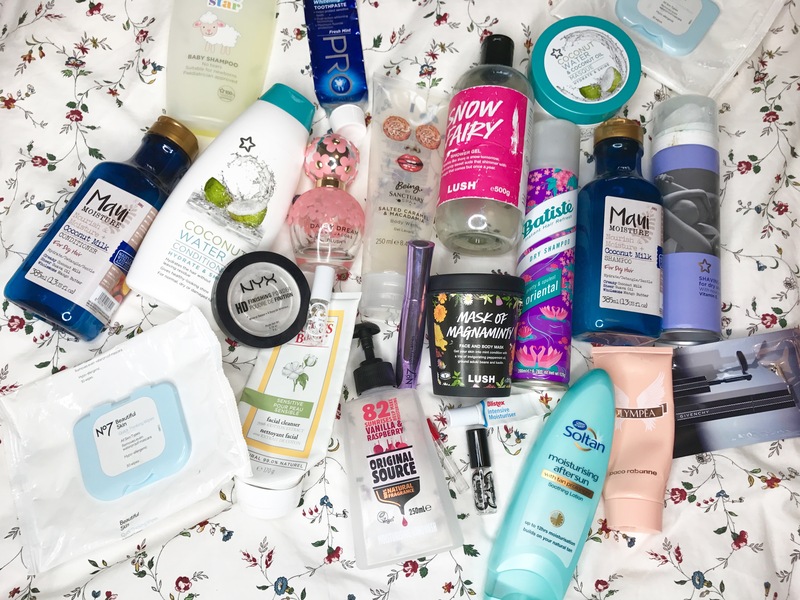 Let me know if you have an opinion on any of these products, also if you have written an empties post please feel free to let me and everyone else know in the comments so that we can all discover some similar blogs! I’ll look forward to hearing from you all, Thanks for reading!